I’m obsessed with oils lately. My skin has been super dry no matter how much water I drink, and introducing oils into my skincare routine has been making an amazing difference in how my skin looks and feels. I have been using oils for cleansing, oils as a facial moisturizer, oils in the shower, and oil sprays. Just gimme all the oils! Here’s the rundown on the oils I have been using and LOVING lately. I would love to know your picks in the comment section. 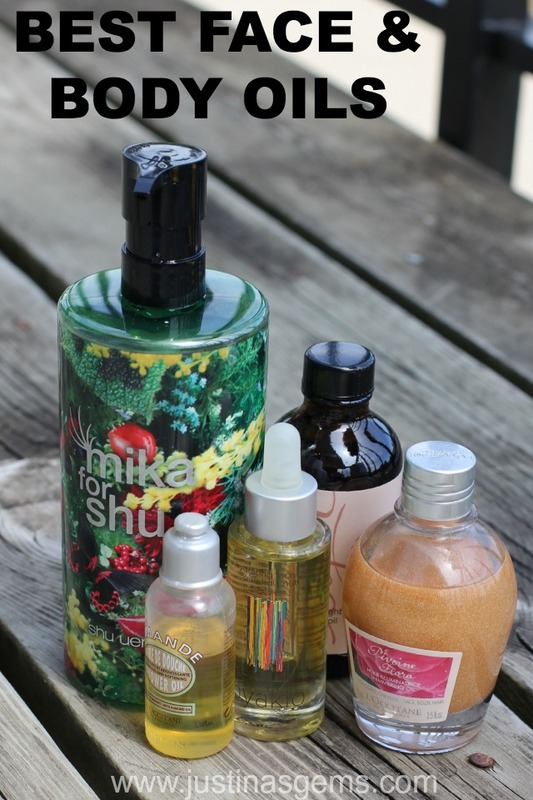 For facial cleansing, I’m dying over the Mika for Shu Skin Refining Cleansing Oil. It comes in the most gorgeous and HUGE pump bottle that I think will probably last me forever, and it’s Shu’s number one cleansing oil (just in amazing packaging). I use two or three pumps to cleanse my whole face. The first pump I usually use to try and dissolve my eye makeup, and the rest of the pumps break up my makeup on the rest of my face. This cleanser uses moringa extract to clear pollutants that accelerate aging, green tea extract with anti oxidants to help revitalize skin appearance, and and gingko leaf extract to bring transparency and radiance to skin. My skin is left super soft after using this cleansing oil, and the scent I pick up on with this is moringa, but it’s super subtle! For cleansing my body, I’ve been obsessed with L’Occitane’s Almond Shower Oil. I got this either as a freebie for buying something in the store or it was part of a gift set. I can’t remember! Either way, it’s so amazing. The scent of the almond in this shower oil is to die for. I have been rubbing it on my big preggo belly in the shower and it leaves it feeling so soft that I don’t even need lotion after! It rubs on as an oil, and when it comes into contact with water, it foams and easily rinses off. It leaves a light scent behind after using it that doesn’t compete with perfumes or anything, although I wouldn’t mind if it stuck around for longer because I love the scent! I was late on the bandwagon for using oils as skincare. When I tried and loved them, I thought they would only work as part of my nighttime skincare routine. Wrong I was! 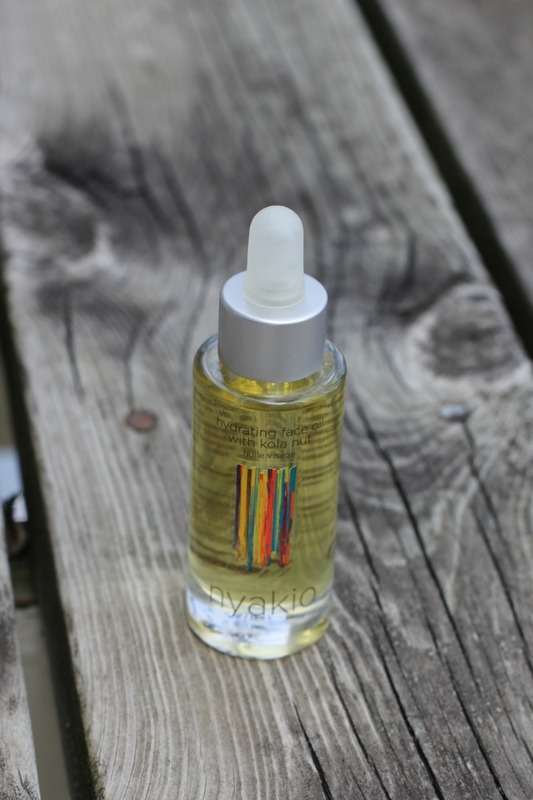 I have actually loved using the nyakio Hydrating Face Oil with Kola Nut as part of my daily AND nightly skincare routine. This particular face oil has a blend of eight oils and hydrates for over 12 hours. I was experiencing severe dryness and tightness in my skin that was creating what looked like fine lines all over my forehead. No amount of moisturizer was infusing the amount of hydration I needed in my skin, which is when I gave this a shot. 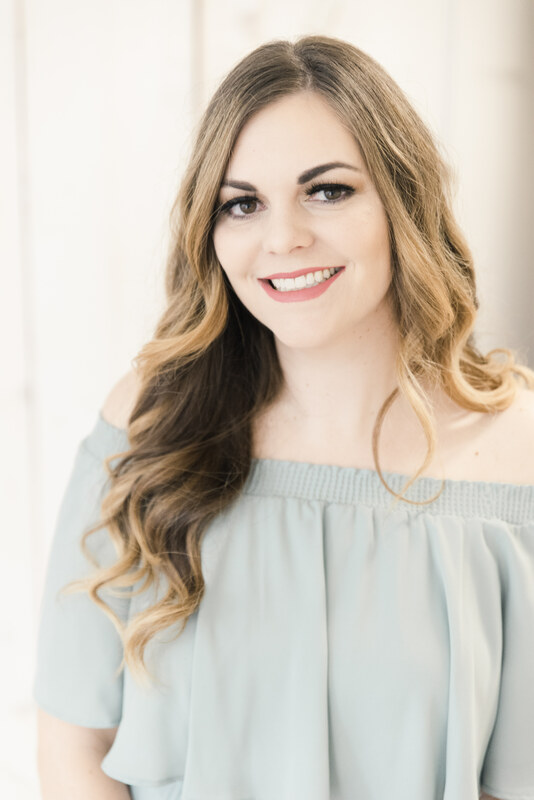 It really made a noticeable difference in the appearance of my skin and gave me instant luminosity rather than the ashy, dry look I had before! It also looks fabulous under makeup! I am finding that they key to using facial oils under makeup is in application. Instead of putting it on my fingers and smearing it on my face, I lightly rub in a circular motion all over my skin until it feels absorbed. It tends to pool near my temples, so I focus a lot of my efforts there when I am rubbing it in. I also wait 2-3 minutes after I’m done massaging it in before I apply makeup! I was so surprised how much nicer my makeup looked with oil as a skincare underneath. If you have previously disliked wearing oil under makeup, try changing your application method. I bet it makes a big difference! 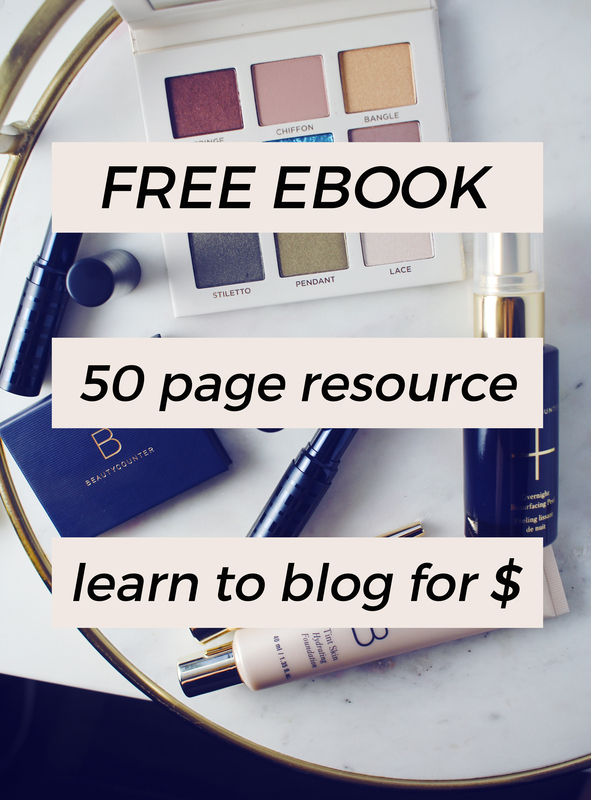 While I’m talking about facial oils, I wouldn’t want to leave out Josie Maran Argan Oil Light! It is a cult classic and everyone loves it in the summer time. I wanted to be sure to mention it because especially in the summer, it’s super easy to find it on QVC as part of a set. It’s almost always available as a mini at Sephora too if you wanted to check there! For my body, I love using oils I can spray or rub on. It is the quickest way to infuse a ton of moisture into your skin and quickly. Zents (not pictured above- can’t find my bottle! )is a brand that I have used and loved over the past year or so, and their body oil in Petal is absolutely to die for. It’s spray on, and it smells super light and feminine. Other scents I love from their line are pear, fig, and oolong. When using spray oil, be sure that you don’t slip and fall after spraying them. So many times, I have sprayed myself on my bathroom tile, and as soon as I go to take a step, I fall on the ground like the big klutz that I am! Lastly, L’Occitane’s Pivoine Flora Shimmering Oil is probably my favorite way to get hydrated skin and feel fancy all at the same time. It is a beauty oil that can be used to highlight the face, body and hair and smells like peonies. You can shake the bottle and the oil will come out of the hole in the top. It smells amazing and leaves behind such a subtle shimmer that I think using this is tasteful for just about any occasion. When my skin is looking for some hydration in the summer, I am almost always reaching for some sort of oil. Have you tried any of the ones I have mentioned? I’d love to hear what your favorite oil is! Awesome post! I’ll have to check out that L’Occitane oil! I’m in need of oils on my skin way more than I ever have been. This is great info! I’m a sucker for oils. I would happily buy any of these. 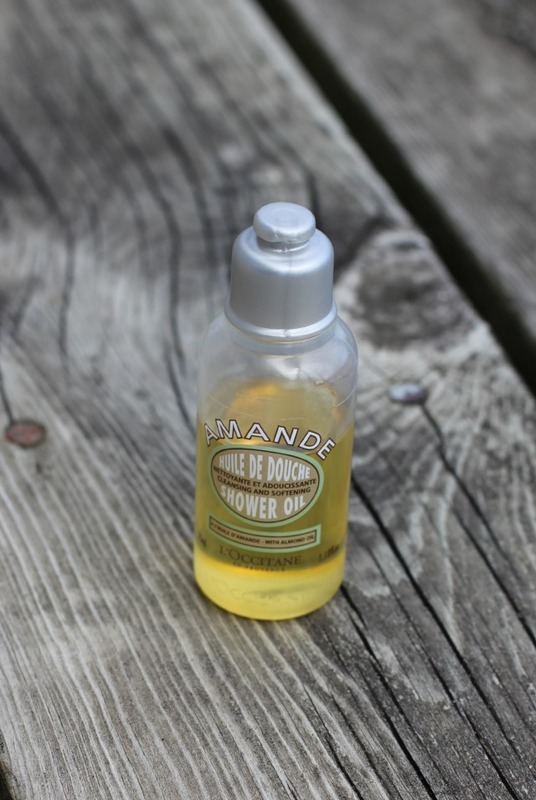 Love, love the L’Occitane Almond shower oil! Thank you for sharing! I love oils and haven’t tried any of these! Sweet picks, mama! I love everything about that L’Occitane Almond Shower Oil. It is amazing stuff. Totally need to try that Nyakio. Love a good face oil for sure!!! Thanks for the recommendations! I love using oils. That L’occitane one looks nice! I agree with you on the oils. They are so soothing. My favorite is rosehip oil. I do oils almost daily. And I also love dry oil. The Shu Oil looks amazing. I’m very fond of the Aveeno body oil with oatmeal that soothes irritated skin! I love Aveeno! I didn’t even know they had a body oil! I have been using a lot of oil, too. I got the Julep cleansing oil in one of my Maven boxes a while ago, and I actually really like it. I also love Kiehl’s facial oil, and for my body, I put some Body Shop (Satsuma is my fave) in a spray bottle and spritz it all over! I want to try that Josie Maran light argan oil.. I am going to buy out Nordstroms of their Kiehl’s stuff during the Anniversary Sale! love oils. i actually really want the Shu one! I want to try L’Occitane shimmering oil. I tried a couple of body oil but haven’t ventured into facial oils yet. 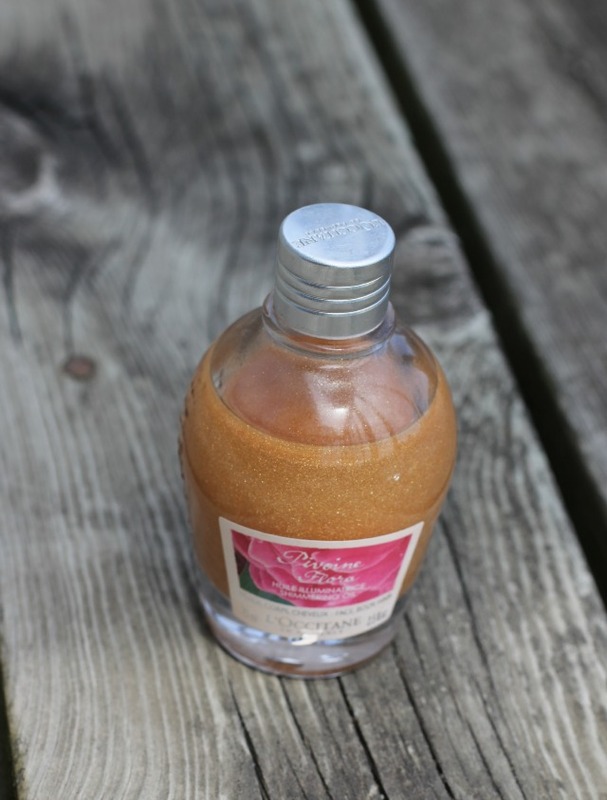 L’Occitane’s Almond Shower Oil is one of my all time favorite! I love oils but I’ve never tried any of these. They sound great. 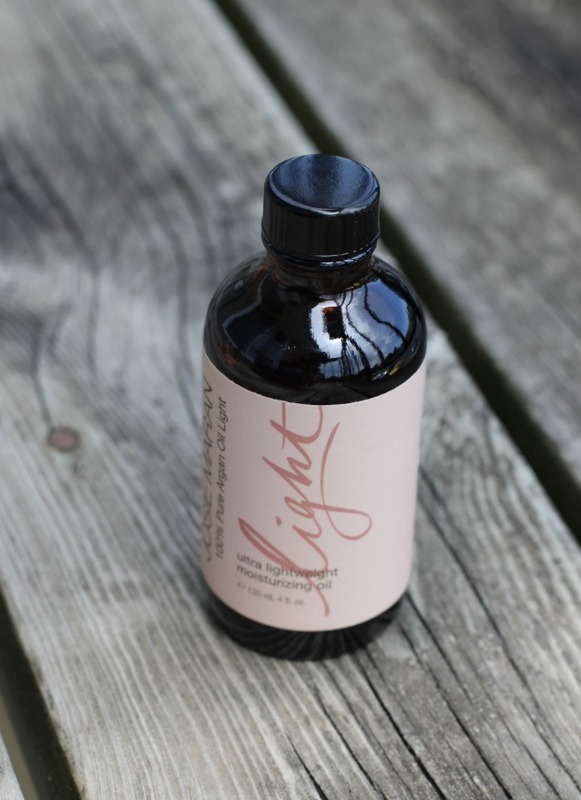 Love oils… I want to try the Light from Josie. I love oils too. THe Shu cleansing oil s awesome. I love that stuff. I lie using oils in my hair too! I feel like oils have been underrated for so long. I’ve been a fan of body oils for most of my adult life and people thought I was nuts. I seriously love every single one of your picks, it’s like you went into my bathroom and raided my own stash of favorites. Love this list! Josie Maran argon oil is one of my faves!